Simply put, it was a good day for Southern Fulton’s track & field team. The Indians had one lone competitor seeded first headed into the District 5 Track & Field Championships on Thursday at Northern Bedford. Chase Varner climbed to the top of the podium in the 800, as expected, but he was joined by two other Indian gold medalists and a host of others in the top three. Also hanging gold medals around their necks were Indian seniors Sarah Wright and Celina Merchant. Wright, who just started throwing last season, won the javelin with a toss of 116-3, while Merchant defended her title in the 300 hurdles, claiming gold in 47.41. 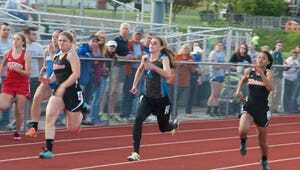 Both girls broke their own school records in their respective events. By earning a gold medal Thursday, Merchant is officially the most decorated athlete at Southern Fulton. She has 20 District 5 medals, including eight gold ones - two from cross country, two from girls basketball and four from track & field. Like Merchant, Wright was seeded third headed into her event but had the winning toss in the preliminaries of the javelin. Unlike Merchant and Wright, Varner had all the pressure on his shoulders as a No. 1 seed in the 800, and more than halfway through the race, McConnellsburg’s Shawn Garlock held the lead. But just before the last 200 meters, Varner kicked it into high gear and won the race in 2:01.53, more than five seconds ahead of the field. Varner was also second in the 400 (51.99) and was part of the third-place 4x400 relay team which finished in 3:37.70. Merchant also earned a bronze medal in the 110 hurdles (17.10). Gavin Wills and Tim Wright were silver medalists for SF. Wills placed second in the pole vault (12-0), while Wright took the silver in the javelin (163-6).